Bidding for Prime Minister Narendra Modi's pin-striped bandhgala suit intensified on Thursday with a Surat-based diamond trader offering Rs 1.48 crore, upping his earlier stake by Rs nine lakh and eclipsing the bid of Rs 1.41 crore of a Bhavnagar businessman. Surat-based Mukesh Patel enhanced his bid to Rs 1.48 crore from Rs 1.39 crore he had offered earlier. The fresh offer outstrips by Rs 7 lakh the Rs 1.41 crore bid by Bhavnagar-based Ship-breaker Komalkant Sharma, CMD of Leela Group of Companies. Made on the penultimate day of the three-day auction, Patel’s bid is the biggest so far, Rs 27 lakh more than Wednesday’s highest of Rs 1.21 crore by textile trader Rajesh Juneja. Earlier in the day, Global Modi Fan Club’s Rajesh Maheshwari, also from Surat, had made a bid of Rs 1.25 crore. There were four other bids of less than Rs 1.21 crore for the suit which Modi had worn during his meeting with the US President Barack Obama. As the monogrammed bandhgala, which according to some reports is worth Rs 10 lakh, hogged all the limelight at the auction, initially there were few takers for the humble Cricket Australia T-shirt gifted to Modi by bowling great Brett Lee which attracted bids ranging between Rs 1,500 and Rs 2,000. “People are only looking for Modi suit. There is a T-shirt of Brett Lee gifted by Cricket Australia just beside the suit, but the bids for it are very low,” said a member of the organising committee. “About 40 to 50 people have placed bids ranging from Rs 1,500 to Rs 2,000 for the T-shirt that Brett Lee gifted Modi during the latter’s visit to Australia in November last year,” he said, showing the written bids of a handful of interested people. However, towards the evening a BJP MLA from Surat and a city-based businessman made two separate bids of Rs 1.11 lakh each for the football world cup jersey and cricket Australia T-shirt gifted to Modi. Harsh Sanghvi, MLA from Surat’s Majura assembly seat, said he will donate the FIFA World Cup T-shirt to a team of blind sportspersons if he won the bid. “I have made a bid of Rs 1,11,111 for the FIFA T-shirt that was gifted to Prime minister Modi during his visit to Brazil after football World Cup last year as I want to donate it some blind people's team either of cricket or football,” Sanghvi said. “I have preferred the T-shirt over other items as I am young and want to encourage the youth of my constituency who are pursuing a career in sports. This will surely encourage them,” added Sanghvi. Surat-based Vrajesh Unadkat, who is into construction business, said he bid for the Cricket Australia T-shirt as both Modi and Lee are “icons” for the youth. “If my bid succeeds, I will gift the T-shirt to a local cricket team,” he said. Amid the media hype surrounding the auction, Congress workers held a protest outside the venue -- Science Convention Centre -- calling the event an act of “self publicity”. “Swine flu cases are on rise in the city, the state and also in the country, but the Bharatiya Janata Party government has neglected poor patients. Now they hold such extravaganzas in the name of cleaning Ganga. The people of Varanasi should ask Modi why he did not fulfil the promises he made,” Surat city Congress president Naishad Desai told reporters. “Modi has organised this extravaganza merely for self publicity and personal gain. This property belongs to the nation and certainly not to him,” Desai said. The auction, apart from protest also drew derision, with Janta Dal-United president Sharad Yadav calling the suit “historic” which should be kept in a museum. “The suit is historic in nature. It should not be sold, but kept in a museum. The future generation can view it and they can learn a lot from it. No one should ridicule it...All this will increase tourism,” he said in Delhi, taking a jibe at the PM. 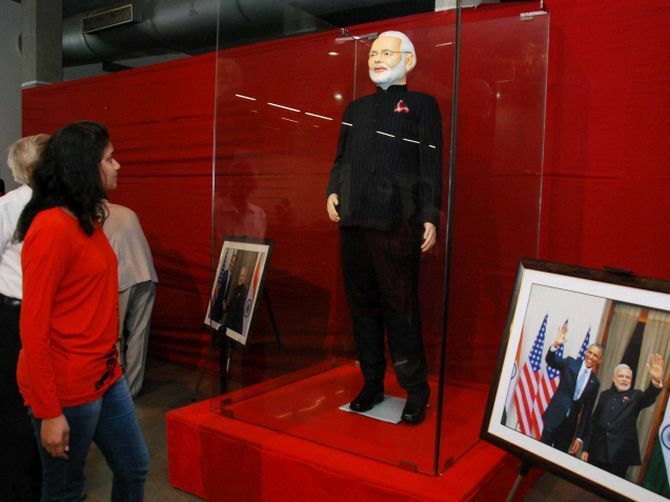 The suit is among 456 items received by Modi as gift during his tenure as PM which are being auctioned by the Surat Municipal Corporation. The proceeds will be utilised to fund his ambitious ‘Clean Ganga Mission’. He got suspended from school for watching World Cup!